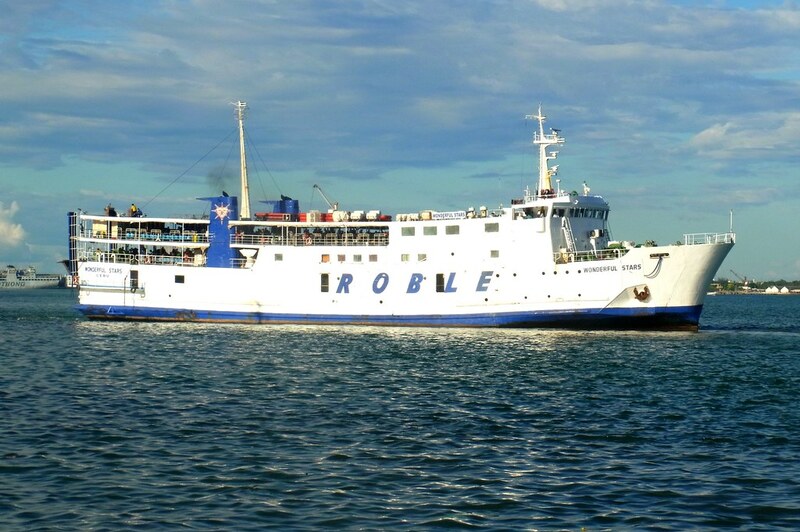 The overnight ferry-RORO ship “Wonderful Stars” of Roble Shipping Lines of Cebu was hot in the news since yesterday, August 15, 2015 because of the fire which hit her in Ormoc City, Leyte, Philippines. She managed to dock and the fire was put out after about eight hours but the damages to the ship and cargo were heavy. However, except for two injured crew members there were no other casualties. “Wonderful Stars” was the “Ferry Agata” when she was still sailing in Japan waters before she came over here. She was owned by the respected Japan regional line Kyushu Yusen K.K. 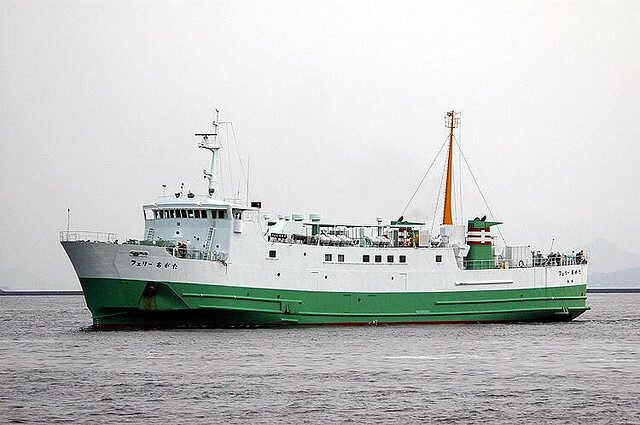 “Ferry Agata” is among the many sisters commissioned by the company to sail their routes, among many other kinds of ferries. This ferry was built by Naikai Zosen in their Taguma plant in Yard #445. Her keel was laid on February 10, 1979 and she was launched on May 9, 1979. After installment of equipment and sea trials she was delivered to Kyushu Yusen on July 14, 1979. She possessed the permanent ID IMO 7903809. She is not MMSI-equipped, however. “Ferry Agata” was a two-deck, steel-hulled ship with the dimensions 71.33 meters LOA/64.01 meters LPP by 13.42 meters Breadth with a Depth of 4.63 meters and a Draught of 3.7 meters. Her freeboard was 930mm and she has high sides. Originally, she measured 1,296 gross tons with a net tonnage of 398 and capacities of 498 passengers and 50 cars. She had a service speed of 15.6 knots with a fuel consumption of 16 tons of marine diesel per day at average speed. She is powered by two Niigata diesel engines that totaled 4,200 horsepower driving two fixed-pitch propellers. She came over to the Philippines in 2007 to belong to Roble Shipping Lines of Cebu. Scantlings and a passenger deck were added to her but her Gross Tonnage remained at 1,296 (which is a local measurement magic). Her Net Tonnage increased to 540, however, which seems to be a fair measure. Her declared Deadweight Tonnage or DWT is 546. Passenger capacity is over 800 now (however, some of that are “sitting”). Her route here was Cebu-Ormoc and vice-versa and usually she take six hours of sailing for the route. “Wonderful Stars” usually have a full load of rolling cargo but a small portion the forward section of the car deck is used for loose cargo. In the Cebu-Ormoc route she was probably the best ship and among the biggest, at least in the regular sailers. Having sailed with her I noticed that the Cabins seem to be original or at least the lay-out is original. The Tourist is in the middle with the Cabins on the side. On the rear of this same deck are the cruel fiberglass seats “specially designed” for six hours of sitting. On the upper deck which was added here are the non-air Economy Section and the restaurant. 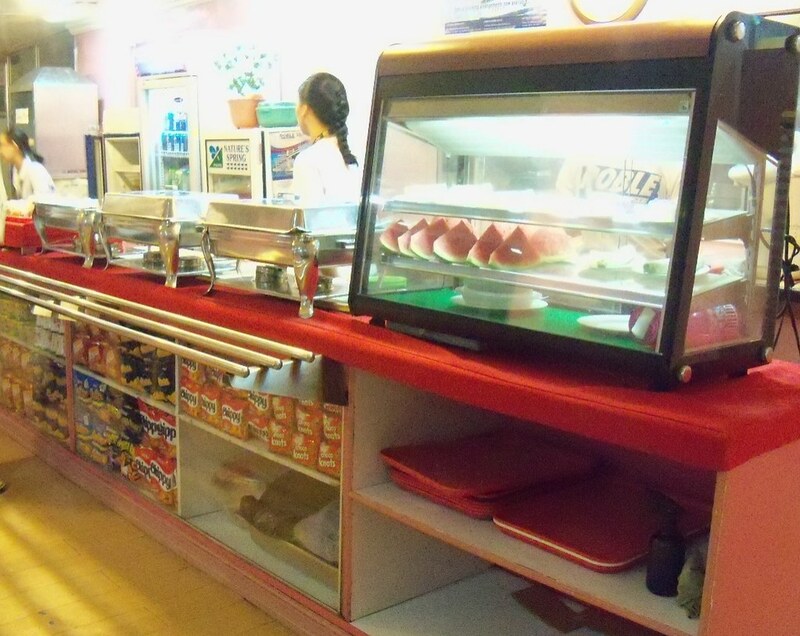 I will note that among intra-Visayas overnight ferries she has good food and service and the prices are moderate compared to other ships. No need to bring value meals from the favorite fastfood. On August 14 evening she sailed from Cebu to Ormoc with over 500 passengers and a crew of over 60 (including apprentices, I guess, since the number is high). Also aboard were 23 vehicles with a few trucks (she is actually a favorite RORO ferry in the route with a liked departure and arrival times). 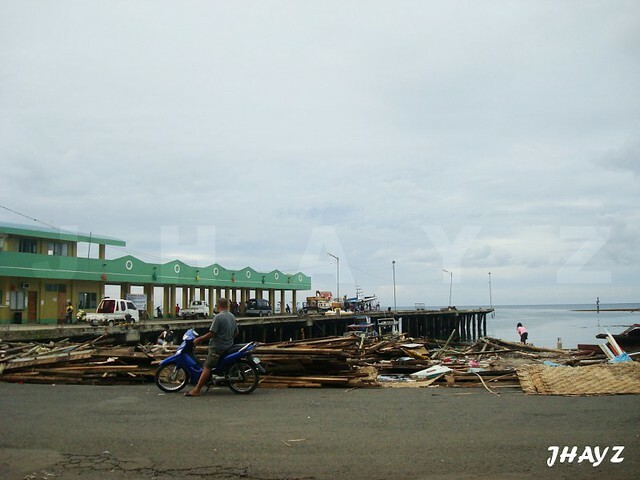 A report said that at dawn abreast of Merida town in Leyte a small fire was noticed near the car deck. 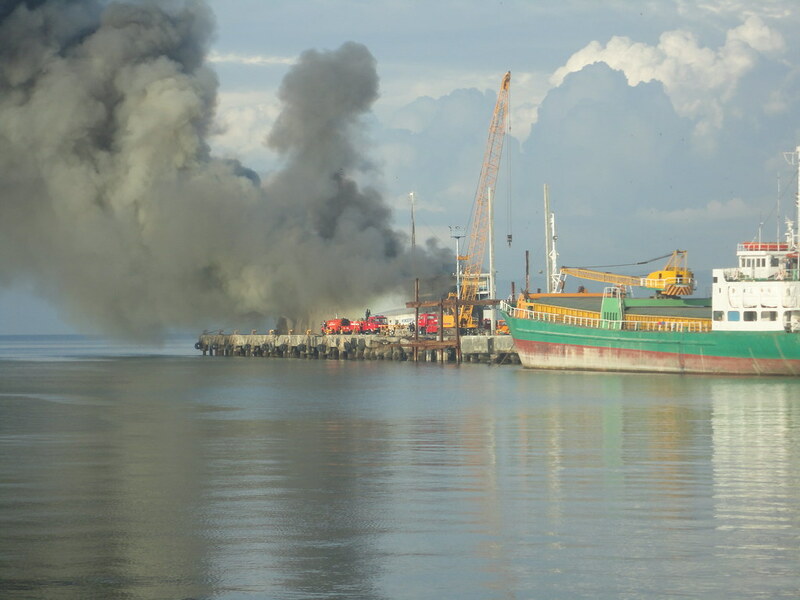 It is said that the ship was able to alert the port and she was still able to dock and unload passengers without casualty although smoke was already billowing. A few of the vehicles were able to get out but it reports say most were caught. The fire raged for about eight or nine hours before it was put under control sometime past noon of August 15 and by that time she was already heeling to port. Hours of bombardment of water can do that to a ship and the pumps might no longer be working. She will not capsize and sink, however, because she is in shallow waters. Reports now say the owners are planning to tow her back to Cebu, maybe for better assessment and possible repairs. The CEO of Roble said the ship is insured for PhP 60 million. The fire bureau estimates the damage at less than PhP 100 million (but I wonder what are their expertise in marine adjustment, the estimation of marine damage cost). The passenger compartments of the ship are gone along with the ship bridge and there were a lot of damaged or lost vehicles. However, it is said the engine room of the ship was spared and if this is true, the possibility of a successful repair and refit increases. As things stand now if she will be repaired it will take months on end. However, Roble Shipping Lines is blessed with spare ships and they already have a new ferry being refitted in Pier 7 Mandaue, the “Taelim Iris”, a Cargo RORO sourced from South Korea but Japan-built. It seems she will be ready even before “Wonderful Stars”. The Deck Loading Ship “LCT 378” capsized and sank off the town of Catarman in the western side of Camiguin Friday afternoon, January 9, 2015, in light to moderate seas spawned by the northeast monsoon that is locally known as amihan. Various reports put 26 or 28 crewmen have been rescued at sea by the passing “Tong Ying”, a big bulk carrier owned by Da Tong Shipping and managed by Ever Gain Shipping, both of Qingdao, China. 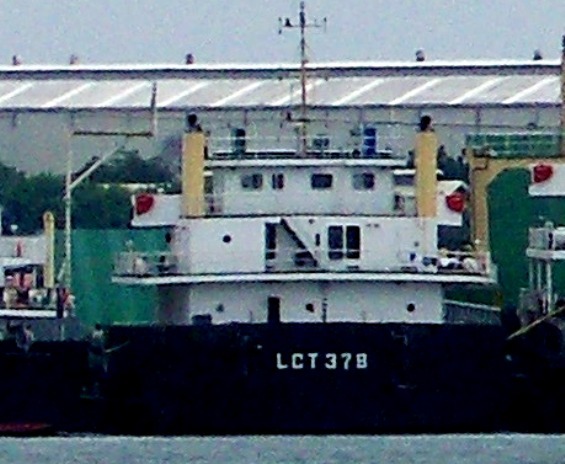 “LCT 378” and “Tong Ying” are both MMSI-equipped. MMSI stands for “Maritime Mobile Ship Identity”, an automatic system for identifying and calling ships and land stations. 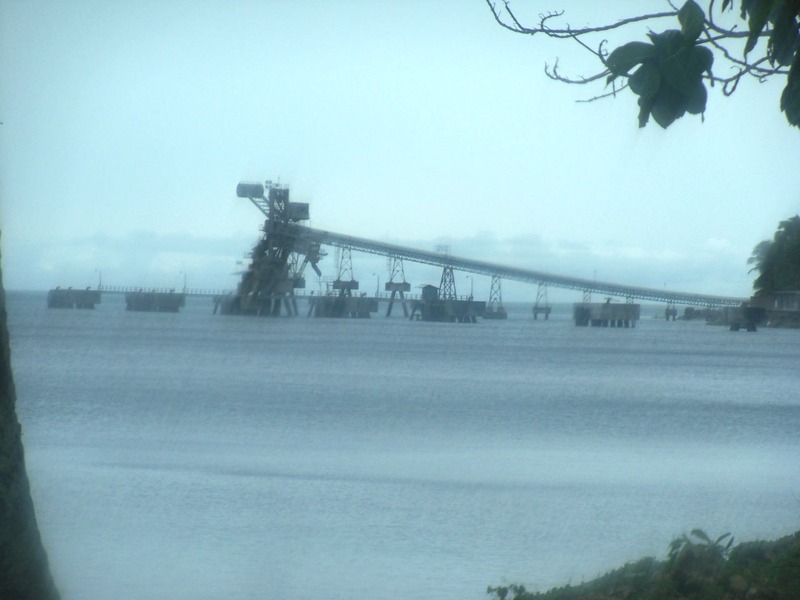 She was a Mongolian-flagged Deck Loading Ship owned and managed by Cebu Sea Charterers of Cebu. She was chartered to carry limestone from the Philippine Mining and Service Corporation (PMSC) in Garcia Hernandez, Bohol to the sintering plant of Philippine Sinter Corporation in Villanueva, Misamis Oriental. The vessel was built by Jiangsu Longli Heavy Industry in Yangzhou, China. She has the ID IMO 9706982 with MMSI Code 457 900078. She measured 87.76 meters by 17.0 meters with a depth of 4.3 meters with a cubic volume of 1,770 gross tons and a usable space of 991 net tons. She was powered by Weichai and developing 900 kilowatts. Open-decked ships carrying earth or ore have been known to capsize in rainy weather and rolling seas. Liquefication and shifting of cargo similar to” free surface effect” can happen in these conditions. Even the carrying capacity of the vessel measured in deadweight tons can be exceeded with the addition of water. The Coast Guard has promised an investigation into the sinking.